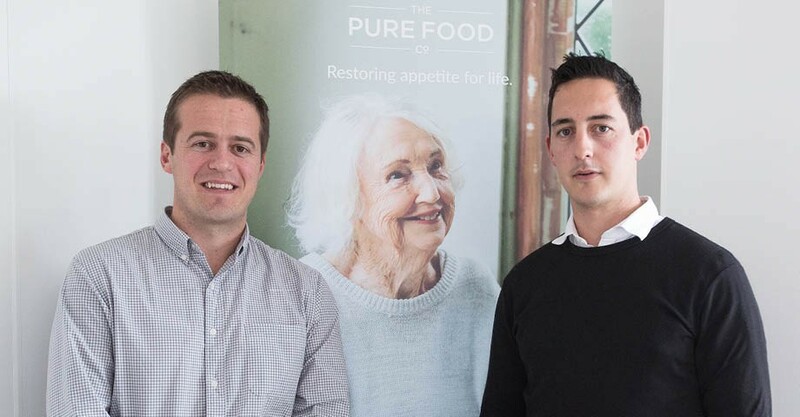 A wide range of nutritionally-fortified meals produced by Auckland-based The Pure Food Co is making strong inroads into the healthcare and aged care sectors, both in New Zealand and Australia. Fast-growing Pure Food, which launched onto the market in October 2014, is now providing one million fortified meals a year to thousands of people, many of whom are elderly and are at risk of malnutrition or have eating difficulties. ``We figured if (soft) fortified foods could be nutritious and delicious, then a whole lot of people's quality of life would be significantly improved,’’ says director Sam Bridgewater who founded Pure Food with his friend Maia Royal (they are pictured above). The company, described by Deloitte Fast 50 as a Rising Star, is supplying most of the public hospitals in New Zealand, the largest age care providers, and people in their homes who can order online or purchase through pharmacies. Pure Food started exporting to Australia in July, supplying a global foodservices company in New South Wales, and is also looking to enter the Singapore and Hong Kong markets where their populations are ageing rapidly. Bridgewater and Royal first operated out of The FoodBowl, jointly owned by Auckland Tourism, Events and Economic Development (ATEED) and Callaghan Innovation. They have since moved their innovative business into a tailor-made processing plant in Stonefields, employing 17 staff. They invested $300,000 in state-of-the-art equipment and the 600 sq m plant has the capacity to produce $20 million worth of sales which would require 50 full-time equivalents. It all started when Bridgewater watched a family member’s illness make it impossible for him to eat and to get the nutrition he needed to recover. Bridgewater reckoned there had to be a better way to bring pleasure and dignity back into eating, and his mission was to create food that will help people thrive when they are at their most vulnerable. For nearly two years Bridgewater and Royal completed research to understand how other people with similar eating challenges coped. They talked to dieticians, doctors, nurses, dentists, food scientists, chefs and consumers. They found that older people especially were not getting the nutrition they needed. In fact, a recent study showed that 47 per cent of older people entering hospital or aged care were malnourished and another 43 per cent were at risk of malnutrition. Through new nutritional science, Bridgewater and Royal developed an effective way to deliver more nutrition by fortifying fresh foods with high-strength protein and energy. Pure Food’s unique solution is that the gluten-free meals are served as individual components (meat, vegetables, snacks and desserts) rather than one mash of pureed food – the look and taste are consistent with the colour, flavour and freshness of a normal meal. “We decided to provide a real food solution that keeps people well nourished,” Bridgewater says. Pure Food now offers 30 recipes. Consumers can choose, for example, hickory pork slow cooked in a barbeque sauce, creamy broccoli cooked in a béchamel sauce, roast pumpkin with a hint of cinnamon, or even a high-protein vegetarian yellow lentil curry. A recent Callaghan-funded research project analysed multiple health outcomes of Pure Food customers. The research demonstrated the impact fortified foods had on the wellbeing of older people, reporting more independence, less falls, reductions in skin problems and fewer hospital stays. Pure Food is also showing flair and innovation by developing 3D food printing technology. The fortified carrot puree, for instance, will be printed into a bunch of `real’ carrots sitting on the plate – and the printed carrots will have the exact nutrition and individual needs. Pure Food worked closely with ATEED to establish its business. ATEED facilitated a Callaghan Innovation Getting Started grant under the Regional Business Partner (RBP) Network programme to kick off its R&D phase. “It took us a year to understand what we were creating,” says Bridgewater. Callaghan backed up with the Project grant, and when it was ready to start commercialising Pure Food moved into the FoodBowl, near the Auckland Airport. At the FoodBowl, Pure Food refined its manufacturing processes and completed pre-production runs before launching onto the market. ``The FoodBowl incubator is a cool facility with world-class skills and equipment,’’ said Bridgewater. Pure Food operated at The FoodBowl for two years before moving into its own processing facility. The company attended Callaghan Innovation’s Better by Lean workshop in November 2017, and utilised RBP business capability vouchers. ATEED’s Local Economy Growth Manager, Paul Robinson – who provided insights into the healthcare food services market and connections - says The Pure Food Co has developed a unique range of textured modified meals. He says the founders have taken a very regimented and disciplined approach to determine an opportunity in this area. They have developed a very compelling investment proposition. The Pure Food Co’s business: Produces wide range of nutritionally-fortified meals for the healthcare and aged care sectors, and home-based customers. Location: Headquartered in Stonefields, Auckland. Export markets: Australia, Hong Kong, Singapore. ATEED assisted by: Facilitating Regional Business Partner business capability vouchers and Callaghan Innovation R&D grants; introducing The Pure Food Co to the FoodBowl innovation processing plant and creating connections. Whether you're looking to start, grow, innovate or export, our Business Support Helpdesk can help.